Not just stripped but completely joe mangled. Like someone took a drill to it. Anyhoo I would normally think the fingerboard needs to come off but this particular year of Warwick basses the truss rods just slide on out. I’m thinking if I can glue a rod into the mangled nut I should be able to loosen the rod and get it to slide out. I just don’t want to glue the truss rod in there so it will have to be super strong and super viscous glue. Tricky one. Perhaps you can get a screw extractor in there. Or if you try to glue a rod in there, I'd use a length of threaded rod, but file lengthwise grooves in the end (or it will just unscrew), or use one that is slightly large and file back the threads. Then I'd try to get some lengthways scratches in the trussrod bolt as well - roll up some coarse sandpaper. Or if you can get a dremel in there, try putting a little trench down each side. Also clean everything with solvent. Then for glue, I'd use epoxy putty, like "knead-it steel". Try to mooch it around the rod with a small and long screw driver or a piece of stiff wire or something. Leave the glue several hours, or overnight, to get as hard as possible. To turn the rod, jam two nuts together and use a spanner. Also try asking this on an american luthiers forum. The busy workshops over there will do vintage guitars with these sort of problems all the time. Cool, thanks for the suggestions Rob! Well, gave it a shot with Mr Searle and a dremel cutting slots but no joy. I also tried WD40 and still nothing. The nut is tearing apart at this stage, 5mm Allen reverse action. David pointed out as well you can feel a bulge under the first fret marker where the rod is pushing out the board. This is what would have originally been in it, I assume from the fretboard bulge it’s in the standard way and hasn’t been flipped over. I was watching some other bolt extraction videos after Rob’s great screw extraction demo and for standard thread bolts left handed drill bits can grab, since this is reverse action I could just drill with a normal bit for the same attempt. Then I thought well it’s falling apart could I just drill and break the nut and rod then slide it out? It’s toast so I’m just trying anything to get it out before heading down the fret board removal path. The frets are pancakes too so it will be getting a fret job too. The Frost 5-piece extractor set gives you a few sizes to make sure you get a snug fit. I'd squirt/dribble a bit of silicone spray around the outside edge of the nut-wood area, and maybe a tiny drip of WD40 in the centre, if it goes to the actual rod-nut interface. The danger is that the action of the extractor will tend to exert expansive force on the nut, and may split it, so you will tend to want to use the smallest one you can get away with - without spinning and mashing more. A real tightrope act. Once set up, go real slow (and firm) and while exerting the forward pressure I'd use a tiny tack hammer to give it a little whacks in the right direction just to encourage it to let go and start moving. Ok if extractors don't work and you're not keen to glue how about cleaning out the mess of a hole and threading it so that you can put something in there like a bolt and use that to pull the rod out? If the bulge on the first fret is going to stop the rod from slipping out it doesn't really matter what you do because you are going to have to pull the board off to make the repair. 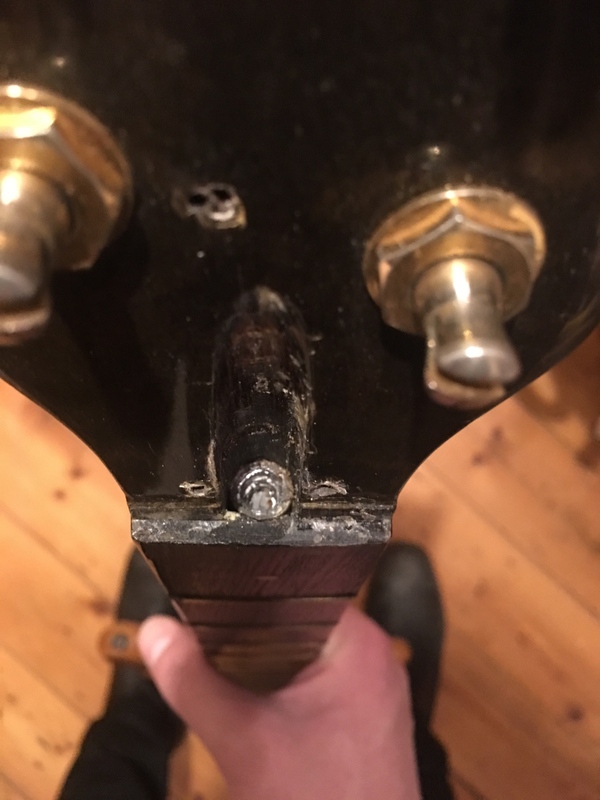 You might get away with cutting a slot down to where the bulge is hanging up and patching afterwards but I'd probably not bother and do a new fretboard anyway. I would try and thread it (looks like there is space to do that), put in a suitably threaded bolt with 2 nuts, tighten everything and try to loosen the tension. As Blaine says, not much to lose. I'm with Michael. If you got a thread in there you might be able to get a bolt in and pull it out using that. If you're worried about the thread not holding, red-Loctite it before trying to pull it. Ahhh.. so it's a 2-way rod that's maxed out in the anticlockwise direction, right? So it's pushing up on the fretboard instead of down on the neck. So you need to turn it clockwise just a half turn or thereabouts do you? In that case, I get it now. Apologies, because screw extractors won't work. They are (obviously) for loosening in an anticlockwise direction. So, yeah like others have said, I'd tap it. You'll need to ask for a "bottoming" tap, and you'll have to choose carefully. You'll probably need to skim the hole with the right sized tap drill and obviously you'll need a bolt or a length of threaded rod plus two nuts to jam together on it. Bottoming taps aren't easy to start but a starter tap is probably too long. So you may need to chamfer the rim of the hole to get the thread started. You'll probably only get one shot at it so I'd also use a little epoxy in there too. Here's some pics of old Warwick rods in various states including a brutal removal with a hammer. ok, now I'm confused. It's a one-way rod, with separate nut, that tightens anticlockwise, is maxed out, but still pushing up on the 'board??? Weird. Anyway, to turn it clockwise, yeah, I'd try and thread it. Best of luck mate! It’s odd yes. The rod appears to have been taken out and flipped over to push the other way. I didn’t know until recently that was an option.